CarGurus has 40,566 nationwide Traverse listings starting at $2,500. 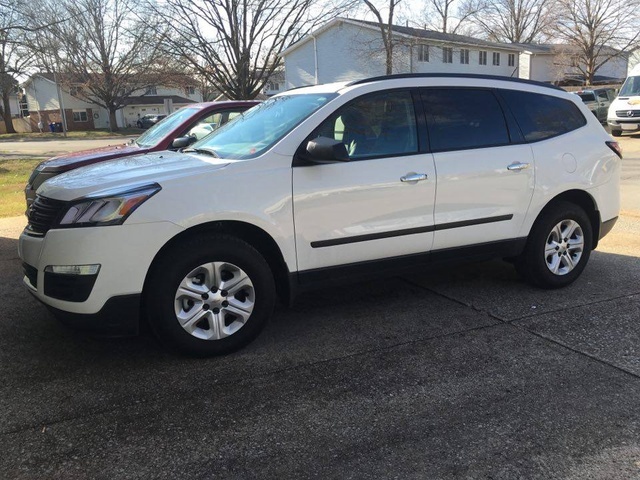 For those practical types with larger families or a lot of car-less officemates or who just won’t be caught dead in a minivan, the 2015 Chevrolet Traverse is right down your alley. This full-size crossover ute will seat up to 8 folks in 3 rows and packs what Chevy claims to be a class-leading 116.3 cubic feet of cargo capacity with all rear seatbacks folded. Meanwhile, a few tweaks that debuted for the 2014 Traverse stable are rumored to be further complemented by some added exterior color choices for 2015. Additionally, hints of a cooled storage bin and some shuffling of standard and optional features are accompanied by whispers of a turbocharged inline 4-cylinder (I4) powerplant and auto engine stop/start technology. In any case, this hefty crossover is likely to return with the usual trim lineup, beginning with the base LS and running through the up-featured 1LT, the penultimate 2LT and the flagship LTZ. Again for 2015, the Traverse stable is expected to be delivered in the standard front-wheel-drive configuration (FWD) with weather-busting full-time all-wheel drive (AWD) once again available. Until confirmation of anticipated changes, look for this hefty hauler to return packing the same standard 3.6-liter V6 engine, as well as the well-wrought 6-speed shiftable automatic transmission. This combo should once again put out 281 hp and 266 lb-ft of torque with the standard single exhaust in lower trims, while the LTZ comes with a dual exhaust that bumps the ponies up to 288 hp while torque leaps to 270 lb-ft. Towing, meanwhile, should again be maxed out at 5,200 pounds with the optional towing package installed, while mileage estimates ought to remain 17 mpg city/24 highway in FWD trims and 16/23 in AWD editions. Anticipated upgrades to the 2015 Traverse should include, depending on the trim selected, 17-, 18- or 20-inch steel or aluminum wheels, a rear spoiler, a power rear liftgate, heated power-adjustable outside mirrors, premium cloth upholstery and heated power-adjustable front seats. Look for lower trims to come with standard second-row bench seats for 8-passenger capacity, while the LTZ is expected to return sporting standard captain’s chairs in the middle row, thus reducing seating capacity to 7. Specific 2015 Traverse variants are expected to once again boast OnStar/Bluetooth Directions and Connections technology, a rear-view camera, front and rear air conditioning, cruise control and telescoping tilt-wheel steering, with higher trims adding on dual-zone climate control, remote engine start, rear parking sensors and a remote garage door opener. The top-shelf LTZ, additionally, should again feature standard memory for driver's settings and a heated steering wheel. The entry-level LS, meantime, is expected back with a 6-speaker AM/FM radio and 6 months of complementary satellite service, while higher trims throw in a Bose premium system flaunting a single-CD player and 10 speakers. Noteworthy options, barring significant upgrades for 2015, should remain hard-drive-based navigation, rear-seat DVD entertainment, a power sunroof and a Bose Surround Sound audio upgrade. Of course, lower trims should again remain eligible for a number of features that come standard in higher trims as optional equipment. Standard safety items returning to the 2015 Traverse lineup are expected to include 4-wheel antilock brakes (ABS), traction and stability control, front side-mounted airbags and 3-row head airbags. Again depending on the trim selected, look for daytime running lights, front fog/driving lights and turn-signal-integrated mirrors to also make a return engagement. Look for the top-end LTZ, meantime, to sport forward a collision alert, lane-departure warnings and a blind-spot alert that were made standard in 2014. What's your take on the 2015 Chevrolet Traverse? Users ranked 2015 Chevrolet Traverse against other cars which they drove/owned. Each ranking was based on 9 categories. Here is the summary of top rankings. 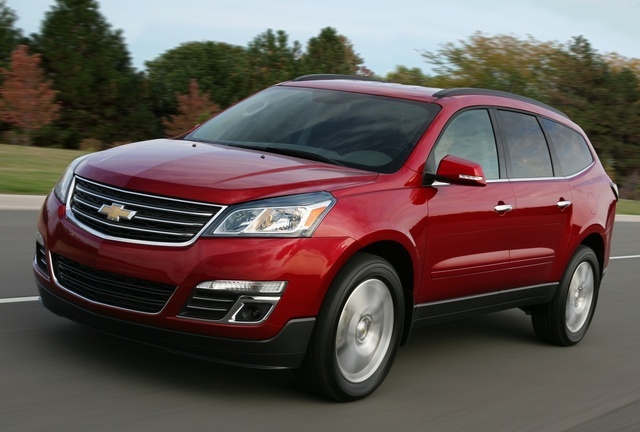 Have you driven a 2015 Chevrolet Traverse? How To Change Km To Mph On Chevy Traverse? I have 2015 chevy traverse and it was running fine they just won't start back up again. I check everything and nothing happen. Is it my engine I need help.